Randall Tharp walked on the stage Sunday evening at the Century Link Center needing to weigh in just over 10 pounds of bass to take the lead in the Forrest Wood Cup. Tharp pulled three decent-size fish out of his bag and put them on the scale. Then he let the drama build a little before pulling two more out. The two big bass drew a loud cheer from the large crowd. 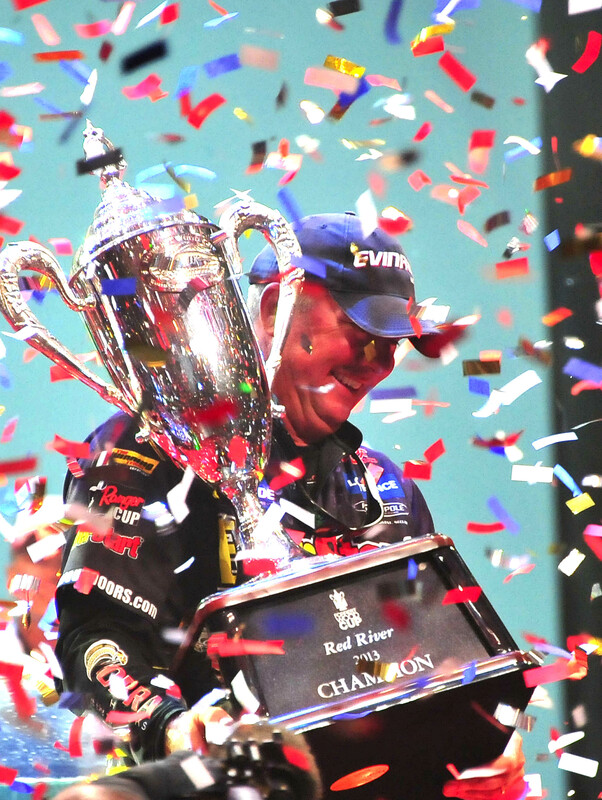 Forrest Wood Cup champion Randall Tharp holds his trophy as confetti falls at the CenturyLink Center Sunday evening. Tharp’s five-fish haul of 14 pounds even gave him a four-day total of 53 pounds, 3 ounces and a 4-pound lead over defending champion Jacob Wheeler. Tharp had to wait for one more angler to weigh in — Day 3 leader Bryan Thrift. Thrift and Tharp had been neck-and-neck throughout the tournament. Tharp had narrow leads after Day 1 and Day 2, and Thrift led by four ounces after Day 3. Thrift needed 13-12 to tie Tharp and 13-13 to win the $500,000 first prize. When asked by the announcer if he had five fish, Thrift said he did. But the lack of enthusiasm in his voice told the story. Thrift’s five fish weighed just 6-11, and the title was Tharp’s. It was Tharp’s first Forrest Wood Cup victory. Two years ago, he finished second on Lake Ouachita. “I was really disappointed a couple of years ago,” said Tharp, a resident of Port St. Joe, Fla. “It was probably the most perfect tournament I’ve ever fished in my life and I came up second. Tharp had fished in tournaments on the Red twice before, finishing fourth in an Open tournament last year. Tharp used a jig lure for most of the first three days of the tournament, but he switched to a frog Sunday. Tharp also said the support he received from local fans gave him a boost. Wheeler was trying to become not only the first angler to win the event back-to-back but the first to win it twice. He predicted it would take an average of about 12 pounds per day and he was almost right on the money. His 49-2 beat 44 other anglers, but came up just short of Tharp. He still took home $75,000 for his efforts. Wheeler’s 14-3 stringer stringer was Sunday’s biggest. But he couldn’t overcome a 7-4 on Day 1 Thursday.